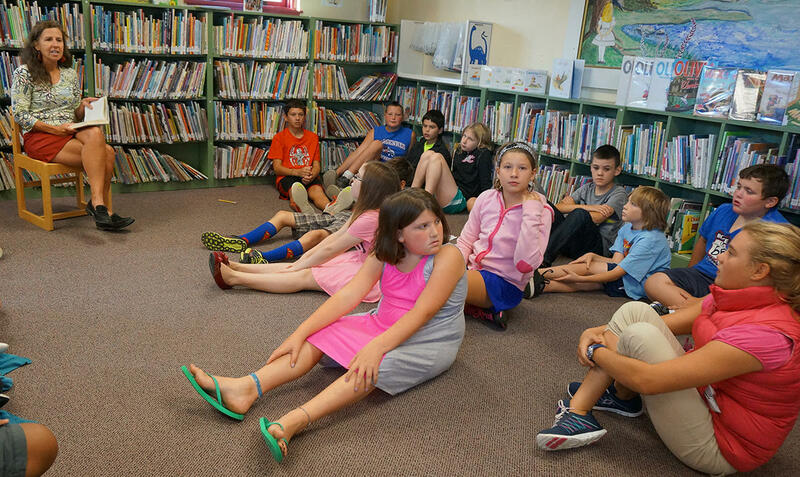 Fifth and sixth graders at Beeman Elementary School gather in the school library to learn about 'Under the Egg'. Theo is the girl at the center of the story. Her grandfather has died, and now it’s up to her to feed the chickens, tend the garden, make her own clothes and make sure they can survive on the dwindling jar of money hidden in her grandfather Jack’s studio. Theo also has a mystery on her hands. With his dying words, Jack told her to “look under the egg.” That instruction could be the key to her survival, or it could mean something else entirely. And she’s not even sure what egg he means. Trent Paquette: How did you get the story idea of Under the Egg? Laura Marx Fitzgerald: One of the central parts of the story came from when I was re-reading the Little House on the Prairie series. It was in 2009 and it was right after the markets had crashed and I was thinking a lot about the way that people in America were kind of living in a mini-depression, a great depression. And the way a lot of people where I was living, in Brooklyn, were going back to these sort-of pioneer methods and they were pickling things and canning things and raising chickens in their backyard. And I started thinking, ‘What would it look like if Laura Ingalls Wilder lived in the center of New York City, in the Village. And that’s how the character of Theo came about. Theo soon finds out there is something hidden under Jack’s painting of an egg: a much older painting. Jack had worked a day job as a security guard at the Metropolitan Museum of Art. Which brought Theo to another conclusion: the painting looked stolen. Matthew DeMers: Are all the paintings that are in the book, are they all real? Laura Marx Fitzgerald: So Matthew, every painting in the book is real, except one. And the one that is entirely fictional is the one that she discovers – that Theo discovers under the egg. "The reason for it was this: I wanted this painting to tell a story about the life of Raphael. But I wanted it to tell a story that is still a little bit of a secret," says Fitzgerald. Beeman Elementary Librarian Nancy Custer Carroll reads Laura Marx Fitzgerald's book "Under the Egg" to a class of fifth and sixth grade students. Fifth grader Kami Clodgo said learning about the art was one of her favorite parts of the book. "About all the Raphaels and Leonardo da Vinci, because I really like art ... I was wondering how long it took to research and get all the information about all of the art," says Clodgo. Laura Marx Fitzgerald: Kami, let me tell you that I spent a lot of time on the research. It’s because the more I research, the more I can procrastinate doing the writing. I love doing research, because you just get to read and discover and uncover. And one search leads you to another search. And one story leads you to another story. Fitzgerald says she spent three years researching and writing Under the Egg. "Along the way I checked out hundreds of books from my library. I spend way too much time in my pajamas doing Google searches. I went to the Met. I went to the Center for Jewish History in New York. I went to Ellis Island," says Fitzgerald. "I went to all kinds of places that would lead me to, sometimes to the answer to a question in the book, and sometimes just to the feel of a place that I wanted to capture." There are two tricky things about writing an art mystery. One is all of the art history research. The other is plotting a surprise ending. Sion Pegues: I’ve tried writing things and then I thought, ‘What will it turn out to be? And then be like, ‘No, that won’t work’ and changed it. Pegues wondered if that happened to Laura Marx Fitzgerald when she was writing Under the Egg. Sion Pegues: Was this the original plan? Like, Jack dying and Theo finding the painting and the mystery happening. Was this the original plan for your book? Laura Marx Fitzgerald: I feel very strongly that if you’re going to write a mystery you have to know what the end is before you start writing. Fitzgerald says the ending of a well-written mystery sneaks up on you, but the surprise seems so obvious when you’re through. "And I love the experience where you think, 'Oh my gosh, it all fits together, and now I want to go back to the beginning and read it again to see how all the pieces were adding up and I didn't even notice it,'" says Laura Marx Fitzgerald, author of 'Under the Egg'. "And I love the experience where you think, "Oh my gosh, it all fits together, and now I want to go back to the beginning and read it again to see how all the pieces were adding up and I didn’t even notice it,'" says Fitzgerald. "That’s the kind of book I wanted to write. So before I started writing, I plotted out every single page, chapter. I knew exactly going in from the very beginning exactly what was going to happen." "Vying for valedictorian you’ve got Leonardo Da Vinci, the quirky super-nerd and Michelangelo the angry but brilliant loner. Then you have the guy everyone wants to be seen with: the star quarterback who’s been elected both Class President and Most Popular. That’s Raphael." Sixth grader Logan Pierro approves, "Yeah, it was really fun to meet all these characters." And, realize it or not, the fun also came with some important lessons in art, literature and history. Next month on Dorothy's List, The Port Chicago 50, a nonfiction book by Steve Sheinkin about a disaster in 1944 that led to a fight for civil rights. Dorothy's List is supported by the VPR Journalism Fund. Sharon Colvin, Vermont's new Youth Services Consultant for the Vermont Department of Libraries, recently had the honor of announcing the winner of the 2014-2015 Dorothy Canfield Fisher Children's Book Award to a room full of Vermont teachers and librarians. However, many of them had already heard the award is going to Chris Grabenstein, author of Escape form Mr. Lemoncello's Library. It's hard to keep a secret from a good librarian. Prisoner 88 is among a handful of historical fiction titles nominated for this year's Dorothy Canfield Fisher Book Award. It's the story of 10-year-old Jake Oliver Evans who, in 1885, is sentenced to five years in the Idaho Territorial Penitentiary for fatally shooting a man who threatened his father. P.S. Be Eleven takes place in a very different time and place from modern-day Moretown, Vermont. The book's three sisters live in Brooklyn, New York in the late-1960s with their Pa and grandmother, who they call Big Ma. But, their mother lives in Oakland, California where she's involved with the radical civil rights group the Black Panthers.